As we approach Summer, what better way to make a delicious and refreshing salad other than a Quinoa salad! It’s vegetarian and vegan – all the more better to share with everyone! Lemon 1/4 cup Freshly squeezed. Combine quinoa and water in a medium saucepan. Bring the sauce pan to a boil over medium-high heat, then decrease the heat to a gentle simmer. Cook until the quinoa has absorbed all of the water for about 15 minutes. Reduce heat over time to maintain a gentle simmer. Remove from heat, cover, and let the quinoa rest for 5 minutes – this gives the quinoa time to fluff up. Once the quinoa is mostly cool, add it to the serving bowl, and drizzle the dressing on top. Toss until the mixture is thoroughly combined. Season with black pepper, to taste, and add an extra pinch of salt if necessary. For an added texture, add pine nuts or cashews to your salad! To maximize the flavours, let the salad rest for 5 to 10 minutes before serving so the dressing is absorbed. Enjoy! What kind of salad do you like making? Let us know! Pichada grew up playing various sports such as track and field, and is now primarily involved in karate and tennis. 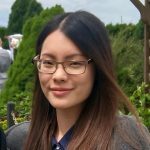 A 3rd year student at UBC, she enjoys using her education to help guide her clients in physical activities to avoid injuries. Pichada has a passion for food adventures, sports, and healthy living, and hopes that she can assist others in their journey to achieving their fitness goals.